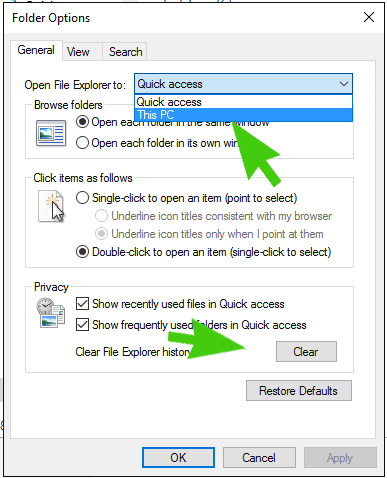 If you are having issues where File Explorer Opens and then immediately closes in Windows 10 it may be due to a problem with Quick Access. You open file explorer from the task bar or start menu in Windows 10. File Explorer opens and immediately closes. 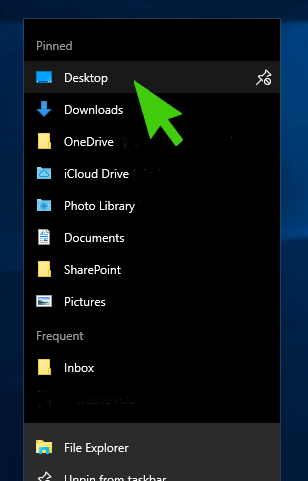 Right clicking on the file explorer icon in the task bar and choosing a folder directly such as the Desktop opens File Explorer normally and doesn’t crash. If Windows 10 is up to date the easies solution is to Disable Quick Access in Windows 10 and change it to open up to My PC by default. As shown above change Open File Explorer to: This PC. At the same time it is also a good idea to select Clear File Explorer History under the Privacy pane. Thanks so much. Solved my problem right away. Sorry, I accidentally gave this a 3-star vote, whereas I meant to give 5 stars – this solved my problem quickly and completely, whereas advice on the Microsoft site wasted a good hour and solved nothing. It’s worth adding that after you’ve fixed it, and cleared history, you can go back to using Quick Access. But, very many thanks. Awesome! Solved the problem immediately! awesome..resolved the issue…is there any specific reason why this happens? It really work. I don’t know you, but you are the best. This is 110% the fix each and every time it happens. Solved the problem immediately! Thanks!! This explanation worked perfectly, thanks! This article indirectly helped me. Since the problem is that File Explorer closes immediately, one can’t get to the toolbar at the top of File Explorer to change options. On the General tab I changed “Open File Explorer to” from Quick Access to This PC. You beauty, exactly what I needed, thank you! Great stuff. Thanks for the tip! This didn’t work for me, but I found the right click to open did. I eventually changed the folder properties under the ‘customize, tab from ‘Optimize this folder for Video” to “General Items” and that fixed it… more by luck than judgement. The directions were simple and the result totally effective. Kudos from the USA. Perfect fix+. That’s why it’s 1st on the Google list for this issue. Well done ! It works = bu what the Microsoft reason ?? Thanks It just worked for me. Thank you mate! Worked perfectly. brilliant. solved that problem. now onto stopping 100% access to the hd for the first 40mins…………….. Exact same symptoms and the solution worked perfectly. Thank you! YES. This works. super cool. Thank you for the assistance. Thank you! Problem solved immediately!